A split second can make the difference between success and failure. A split second can mean the difference between life and death. We live in a word today where things can change in a matter of moments… Are we prepared for an emergency situation or will be stuck like a deer caught in the headlights? When emergency strikes will we be prepared or will be caught napping. For those who have no idea of how to react in situations that they are unfamiliar to, there is an app that can act as a savior for all your needs. The VMEDO app can help you make the change from being a passive component to being the active change that can save the day. If there has been an accident and there are people needing immediate medical attention, that needs an emergency ambulance to get the person to a medical facility without delay. Most of the accidents that are fatal, can be avoided. It is because of fear or lack of knowledge that people stay rooted in the place and not be good samaritans and help the people in need. One simple act of providing first aid or calling an ambulance at the right time can mean the difference between life and death to a person. VMEDO app provides you a list of first aid steps to be followed for various medical conditions such as snake bites, dog bites, bleeding, electric burns, burns, blood loss, allergies and much more. This can enable you to go ahead and help the person in need of first aid. VMEDO app gives you the power to be a super-hero in the lives of people who are in need of emergency medical transportation. The booking of an emergency ambulance is made easy with just the click of a button, the GPS signal provides accurate data of the location and you being new to the community or area is not a concern at all. It also gives you the list of nearest hospitals nearby to rush the patient to. It is to be noted that the GOOD SAMARITAN law makes sure that the police or the hospital staff shall not harass you when you help a patient in the emergency to a hospital. You can now help people without hindrance. Also the VMEDO app helps you find blood donors at the right time by tapping into their network of registered blood donors who can respond to your request and provide you with blood in times of dire need. The VMEDO app is a boon for all medical healthcare and medical transportation needs. You booking an ambulance, providing first aid can mean the difference between life and death to many lives. VMEDO also conducts first aid training with both CPR and AED training provided in Bangalore. VMEDO’s mission to provide accessible and affordable medical transportation and healthcare has evolved through the VMEDO app. 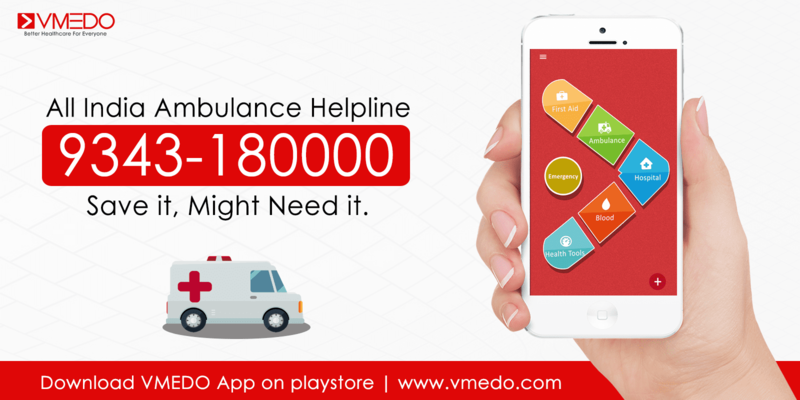 Download the VMEDO app and help save lives. How To Perform CPR on Adults & Kids ?